There has been some confusion over Sierra/Sapphire rear wheel bearings, Ford SA didn't help us, there doesn't appear to be any fixed model/year etc where the bearings changed, most workshop manuals don't have any references that help. There are two (at least) different sizes of bearings, it seems to be that where flanged diffs and Lobro joints are used it is always the larger bearing, however we have seen CV joint driveshafts with both sizes. 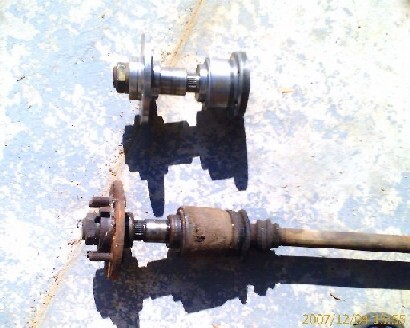 In the picture the top drivershaft/hub is the type with Lobro joints and flanged diff, the bottom one is the CV joint type. To check which bearing your donor parts need simply measure the diameter of the part where the bearing inner sits. Some guys seem to be having problems with finding the right bearings, also there have been some unexplained failures (maybe cheap Chinese bearings) and we have had some delays and problems with machining centres for our uprights. We have now re-designed the rear uprights to accommodate more 'modern' bearings, this way we can produce one upright and supply bearings to suit any of the donor parts. The new bearings are 'bearing units' that is rather than being two separate inners, two outers and two bearings, plus the two oil seals, they are one unit, pre-greased, preloaded with integral seals. So no more packing bearings with grease and no more struggling to fit the oil seals which inevitably end up damaged. Unfortunately we could not find an exact bearing to suit both sizes of driveshaft, so there is some modification required to the larger (Lobro joint) donor parts, this is a relatively straightforward mod that can be done by anyone with (competent) access to a lathe, or any machine shop, or we can get the mod done for a minimal charge (free to purchasers of starter kits). The diagram below should be enough info to get the mod done yourself. 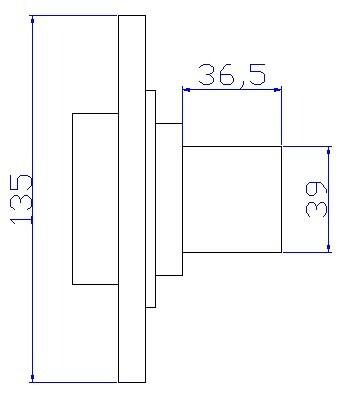 UPDATE Another option is to leave the 40mm length 'as is' and use a 4mm spacer between the hub and the bearing, this is probably better than machining the length. Basically the 41mm diameter is reduced to 39mm, and the length of the bearing surface reduced from 40mm to 36.5mm. Obviously make sure the fillets or chamfers of the originals are duplicated to avoid sharp corners which 'attract' stress. If you are planning on using the Golf calipers and the smaller (and lighter disks) then get the outside diameter of the hub machined down to 135mm at the same time. The new uprights are in production now and will be supplied with all future kits, should you wish to 'upgrade' your old uprights to the new ones this is a straight swap-over, (with machining of hubs if needed), contact Ann if you wish to do this, some guys may qualify for a free upgrade . Last edited by BradW on Wed Mar 26, 2008 10:22 am, edited 3 times in total. I work in the Food and Bev industrie where bearings is a constant \"Threat\". What we have found was that although they are expensive, SKF bearings work the best. We have had FAG bearings fail a lot on the same aplication as the SKF bearing. Try to avoid all these FONGKONG bearings. We ran a vacuum pump for 2 hours after being charged R4000 for an overhaul by the supplier. Finally getting to start planning a build. My reference to Chinese bearings wasn't aimed at you, your problems have me totally confused, unless someone has tipped iron filings in your grease tin . That's something maybe someone can help with, I haven't been abe to find a source for the hub nuts, especially the left hand thread nut, if anyone knows of a source please either let me know and we'll stock them, or post on the Forum to let everyone know. It's recommended to fit new nuts every time you take them off, personally I'd be happy cleaning the nut/thread and using Loctite (stud lock or similar) if the nut/thread is in good condition. You can get those nuts from Ford, but I'm sure they will be available from fastener suppliers, maybe not all, but the bigger ones. The bearing kits I bought came with new nuts so they are available. Locost chassis with Toyota 20 valve blacktop and T50 box. ross wrote: You can get those nuts from Ford, but I'm sure they will be available from fastener suppliers, maybe not all, but the bigger ones. The bearing kits I bought came with new nuts so they are available. You are quite right Ross, you can get them from Ford, but if I recall at some absolutely ridiculous cost. I'm sick of messing around at spares places so I went to Ford and ordered 2x hub nuts. That's not too bad, I'll contact our local Ford guy and see if they have stock. Don't suppose you have Ford part No's do you, saves a lot of time ?. Makes you wonder why the RH nut is more expensive, the LH nut is a left hand thread I would have expected that to cost more. Not sure wether Graemes prices were inc vat or not, but I've checked and we will be getting some 'in stock', might not be till the new year now though. As Ross says most wheel bearing kits come with nuts.